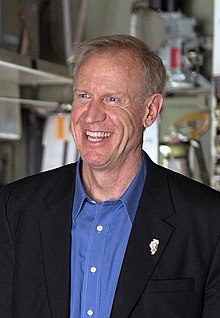 Bruce Vincent Rauner (; born February 18, 1956) is an American businessman, philanthropist, and politician who served as the 42nd governor of Illinois, from 2015 to 2019. Prior to his election, he was the chairman of R8 Capital Partners and chairman of the private equity firm GTCR, based in Chicago. He was the Republican nominee in the 2014 Illinois gubernatorial election and defeated Democratic incumbent Pat Quinn by 50.3% to 46.4%. Rauner was defeated in the 2018 gubernatorial election by Democratic challenger J.
I'm a big outdoorsman... I'm a big hunter. Avid fisherman. Hiker. Climber. Scuba diver. Skier. Love the outdoors. Mitch Daniels in Indiana was the best governor in America for eight years. I've gone to Indianapolis to study with him. I've completely lost faith in the Democratic Party to truly serve the disadvantaged. I don't have a Rolls. I don't have a jet. That's not me. I'm a lover of fairs and corn dogs. A C.E.O. 's job is leadership, problem solving, and team building. I've done that my whole career.